Mr. Naeem Ullah Khan is an Assistant Professor at University Law College, University of Punjab. 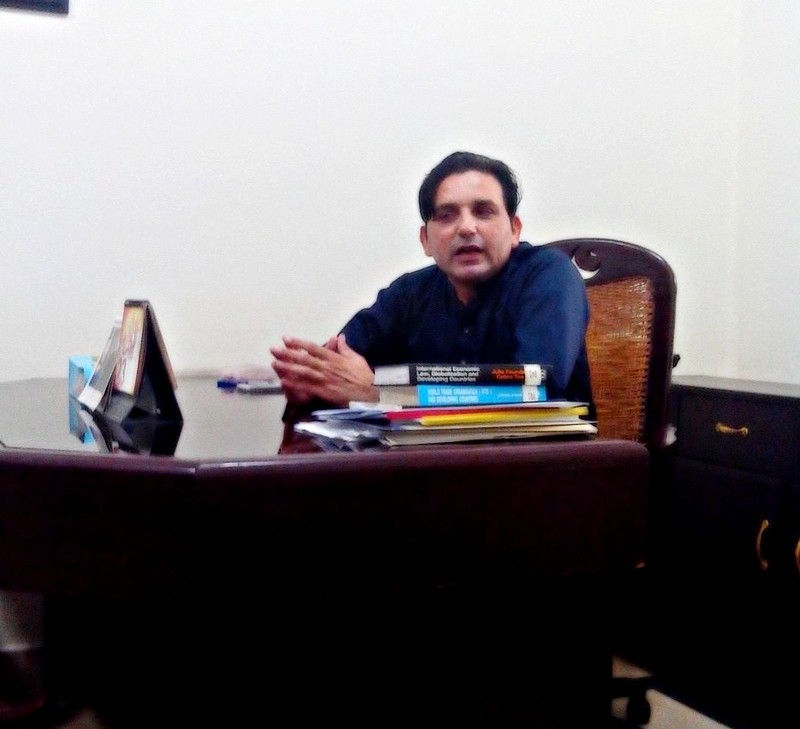 Apart from writing various research papers for reputed national and international law journals and representing University Law College and Pakistan at various international conferences, Professor Naeem Ullah Khan is the first Pakistani author/scholar to publish a book on international economic law with a Pakistani perspective. None of the law scholars in Pakistan have produced a thorough book on on this subject before. The book is titled “International Economic Laws: Theory and Practice in Pakistan” and was published in 2015. Q: Mr. Naeem Ullah Khan, please tell us about your educational background and your life before starting law school. NUK: I basically belong to Bahawalnagar which is a relatively less developed city in Pakistan. Like most of the parents in Pakistan, my parents wanted me to be a doctor or an engineer. Unfortunately, students, especially the high achievers, never used to consider the legal profession as a suitable career. I wanted to set an example that law is not a leftover choice for those who do not get admission into other fields. Due to social pressure I did get admitted in civil engineering in UET (on merit), but my desire to study law could not be suppressed for long. I quit engineering and took admission in LLB in Punjab University Law College. Since then I have been a humble student of law. Q: You said that you wanted to be a lawyer. How come you preferred academics and did not practice after graduation? NUK: I always try to be innovative with what I do. When I was in college, I studied pre-engineering and achieved high scores, but I did not end up becoming an engineer. I wanted to show people that high achievers can also study law. Almost all of my fellows wanted either to practice law or to join the judicial or civil services. One thing that I realized was that, apart from some very good teachers, our education system was not research-oriented and we lacked innovative and critical minds in law schools. During my LLB, due to my good results I was offered a position as a teaching assistant at the same college. It was a matter of honor for me, to be the first ever student in University Law College to be appointed as teaching assistant during my course of study. My thirst for research enhanced and since then has kept on increasing like a never ending disease. Q: How did you develop interest in international economic law? NUK: I opted for international economic law in my LLM. It was solely by chance that I opted for this subject as we had very little exposure to it at the LLB level. However, during my LLM I started taking interest because of my teacher Mr. Inam ul Haq, Former Executive Director of the World Bank. I gradually came to believe that the only key to the development of Pakistan is our economy. Since then I decided to work in this area and spread awareness about its significance and its direct effect on our system. Moreover, I came across the fact that no specific books on this subject were available in Pakistan, except for those written by foreign authors. This lacuna in our research added fuel to the fire. Q: To a layperson, international economic law and international trade is one and the same thing. Please tell us if there is any difference between them or are these interchangeable? NUK: Well, you are right. Those who do not know much about IEL consider is to be related to trade only. IEL has three offshoots; one is International Trade Law, the second is International Finance Law and the third is International Development Law. These three are collectively called IEL. There is no difference, it is just that one is a broader term while the other is a branch of it. Q: Why do you think people should study IEL? NUK: I believe that without understanding IEL and global trends in the economy we cannot progress economically. This is the era of competing on economic fronts instead of political fronts. A close analysis of global policies and international relations reveals that almost every interaction on the international level is backed by an economic agenda. Today, we are all globally linked and it is essential to have international trade and economic relations with other nations. Without this, it is impossible to think of improving economic conditions in our country. Hence, a thorough and deep understanding of IEL is a must. 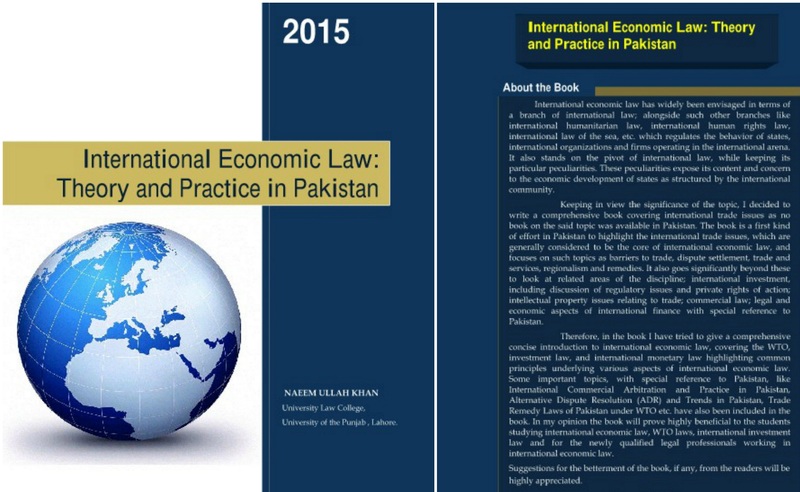 Q: Tell us about your book “International Economic Law: Theory and Practice in Pakistan”. NUK: “International Economic Law: Theory and Practice in Pakistan” is the first book on international economic law that has been produced in Pakistan. Mr. Inam ul Haq, Former Executive Director of the World Bank used to teach us international economic law. He used to reiterate that there was no authentic and thorough book on the said subject for Pakistani students, especially something covering Pakistan’s role and its standing in the international community with respect to IEL and economic policies. It was then that I realized I should contribute something to this ignored yet highly important and fundamental subject. I shared my interest with my teacher and he took the idea warmly. I started working on this book during his lifetime and under his guidance. I would specially like to mention here that without his encouragement and special affection, this idea could never have been turned into reality. Q: What would you recommend to students who want to specialize in IEL but want to practice law as litigators and not just part of the academia? NUK: There is a great misconception that IEL lawyers cannot practice as litigators. There is massive litigation in IEL and various law firms are working in this area. One can surely build his or her expertise in IEL and work on IEL cases. It is a practical subject and not restricted to classroom studies only. There are various forums like arbitrations, transactional matters etc. which involve the study and practice of IEL. In fact, I would encourage students to come into this field because there is no saturation in IEL so far. Hence, it is a win-win situation. Q: What do you think is the reason for the lack of research in IEL so far, considering that no book on the Pakistani perspective on IEL was available before your work? NUK: Well, there are various reasons. People in Pakistan tend to follow general trends instead of applying their minds or weighing their choices. There is also the rational demand of time. Law students most of the time focus on procedural subjects, evidence laws, contract and property laws, etc. which they are initially about to experience in court practice. A lot of work gets done on these subjects because people witness the functioning of these subjects at every level. However, IEL is not as ‘visible’ in our court system. Secondly, the overall growth and development of law in Pakistan has been very slow. Lack of awareness about the subject is also one of the reasons that competent people have not put their energies to work in this field. But fortunately, both the courts and educational institutions are working on it now. There are various judgments of the Supreme Court on record which show that the courts have also realized IEL as a distinct and significant discipline of law. Some universities have also started to work on IEL. Therefore we can expect to see good literature on IEL being produced in Pakistan in future.